The Mississauga Library System (MLS) is the public library system of Mississauga, Ontario. The system has 18 branches, consisting of the Mississauga Central Library and 17 smaller neighbourhood libraries. The Mississauga Central Library is located at 301 Burnhamthorpe Road West, adjacent to the Mississauga Civic Centre. It is the largest branch of the Mississauga Library System, containing four floors of materials and a further floor for silent study, and has functioned as the main library for the system since its opening in 1991. The Meadowvale Community Centre was renovated in July 2014 and re-opened in fall 2016 with a new library within the building. 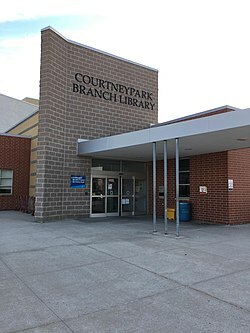 Courtneypark Library shares the building with St. Marcellinus Secondary School. Meadowvale 6655 Glen Erin Dr 1974 At current location since 2016. Shares facilities with Meadowvale Community Centre. It is located on the upper level. South Common 2233 South Millway Drive 1983 At current location since 1998. When it was located at 2227 South Millway Drive, the branch was known as Erin Mills South branch. Woodlands 3255 Erindale Station Road April 7, 1975 At current location since 2014. ^ "Central Library". Library Hours and Locations. City of Mississauga. Retrieved 20 June 2016.